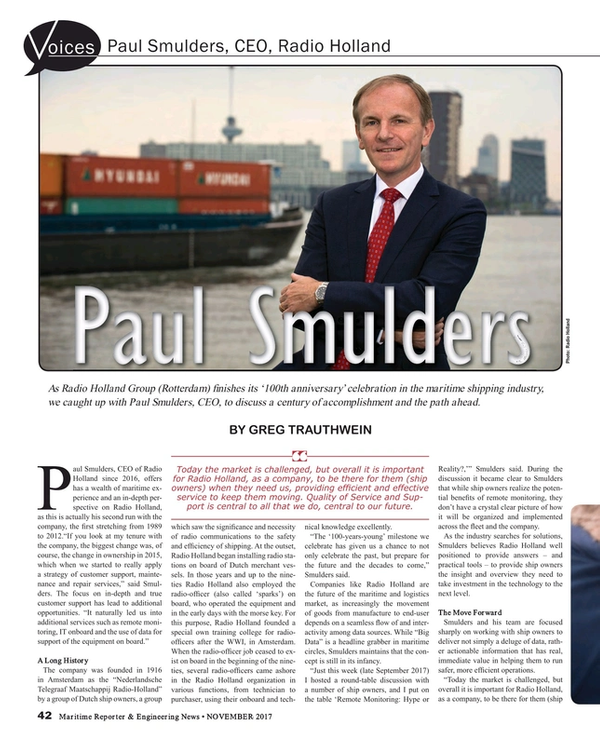 As Radio Holland Group (Rotterdam) finishes its ‘100th anniversary’ celebration in the maritime shipping industry, we caught up with Paul Smulders, CEO, Radio Holland, to discuss a century of accomplishment and the path ahead. Paul Smulders, CEO of Radio Holland since 2016, offers has a wealth of maritime experience and an in-depth perspective on Radio Holland, as this is actually his second run with the company, the first stretching from 1989 to 2012. The company was founded in 1916 in Amsterdam as the "Nederlandsche Telegraaf Maatschappij Radio-Holland" by a group of Dutch ship owners, a group which saw the significance and necessity of radio communications to the safety and efficiency of shipping. At the outset, Radio Holland began installing radio stations on board of Dutch merchant vessels. In those years and up to the nineties Radio Holland also employed the radio-officer (also called 'sparks') on board, who operated the equipment and in the early days with the morse key. For this purpose, Radio Holland founded a special own training college for radio-officers after the WWI, in Amsterdam. When the radio-officer job ceased to exist on board in the beginning of the nineties, several radio-officers came ashore in the Radio Holland organization in various functions, from technician to purchaser, using their onboard and technical knowledge excellently. “The ‘100-years-young’ milestone we celebrate has given us a chance to not only celebrate the past, but prepare for the future and the decades to come,” Smulders said. Companies like Radio Holland are the future of the maritime and logistics market, as increasingly the movement of goods from manufacture to end-user depends on a seamless flow of and interactivity among data sources. While “Big Data” is a headline grabber in maritime circles, Smulders maintains that the concept is still in its infancy. “Just this week (late September 2017) I hosted a round-table discussion with a number of ship owners, and I put on the table ‘Remote Monitoring: Hype or Reality?,’” Smulders said. During the discussion it became clear to Smulders that while ship owners realize the potential benefits of remote monitoring, they don’t have a crystal clear picture of how it will be organized and implemented across the fleet and the company. As the industry searches for solutions, Smulders believes Radio Holland well positioned to provide answers – and practical tools – to provide ship owners the insight and overview they need to take investment in the technology to the next level. Smulders and his team are focused sharply on working with ship owners to deliver not simply a deluge of data, rather actionable information that has real, immediate value in helping them to run safer, more efficient operations. “Today the market is challenged, but overall it is important for Radio Holland, as a company, to be there for them (ship owners) when they need us, providing efficient and effective service to keep them moving. Quality of Service and Support is central to all that we do, central to our future,” said Smulders. In ‘being there’ he means both in person and remotely, consulting regarding specific problems and needs, meanwhile helping owners and managers employ best practices in the monitoring and maintenance of critical shipboard systems. To that end Radio Holland can create ‘dashboards’ to make the data compact and ‘overviewable’ in a quick and efficient way. The Dashboards can contain various key data, depending on what the ship owner would like to see. While Smulders and his team are plenty busy in the present, this CEO enthusiastically eyes the future, and he knows that his top investment (and his top challenge) is attracting the right young people to the business. “To attract young people and to show them the possibilities. It is high technology, it is satellite communications, it is international.” We need to show them the promise of maritime, the future of Radio Holland, said Smulders.